On the 24th (Fri), explore the world behind art at Milwaukee Art Museum, then explore and take pictures at Miller Park, then get engrossed in the history at Mitchell Gallery of Flight, and finally examine the collection at Harley-Davidson Museum. Get ready for a full day of sightseeing on the 25th (Sat): get a new perspective on nature at Milwaukee Public Museum, contemplate in the serene atmosphere at Basilica of St. Josaphat, and then savor the flavors at Food & Drink. To find more things to do, ratings, where to stay, and tourist information, you can read our Milwaukee route maker . Chicago to Milwaukee is an approximately 1.5-hour train ride. You can also drive; or take a bus. In May, Milwaukee is a bit cooler than Chicago - with highs of 66°F and lows of 47°F. Wrap up your sightseeing on the 25th (Sat) to allow time to travel to Miami. On the 26th (Sun), examine the collection at Vizcaya Museum and Gardens, then wander the streets of Lincoln Road, then kick back and relax at South Beach, and finally contemplate in the serene atmosphere at St Patrick Catholic Church. 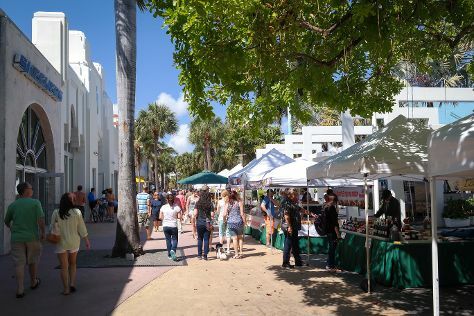 Get ready for a full day of sightseeing on the 27th (Mon): don't miss a visit to Ocean Drive, then appreciate the extensive heritage of Art Deco Historic District, then race across the water with a speed boat tour, and finally buy something for everyone on your list at Bayside Marketplace. To find more things to do, photos, reviews, and tourist information, read Miami online day trip planner . You can fly from Milwaukee to Miami in 7.5 hours. Other options are to do a combination of bus and flight; or drive. The time zone changes from Central Standard Time to Eastern Standard Time, which is usually a 1 hour difference. Expect much hotter temperatures when traveling from Milwaukee in May; daily highs in Miami reach 87°F and lows reach 74°F. Finish up your sightseeing early on the 27th (Mon) so you can travel back home.